There has been a recent rise in the number of lurid headline stories about photographers being confronted, and in some cases even attacked or arrested, for simply taking a picture. Even the esteemed Editor of Photography Blog was recently stopped and searched by the police. In an age of heightened fear about terrorism, using a DSLR camera is increasingly being perceived as a crime, rather than a hobby. Using a DSLR and a tripod can really get you into trouble with the authorities, as you're suddenly seen as an expert. UK photographer John Kelly was ordered to delete all of his pictures of people in public in Blackpool by a police community support officer. US photographer Andy Carvin was threatened with arrest at Washington DC's Union Station, despite having a press pass. Even world renowned author Scott Kelby ran into trouble in Times Square, New York. 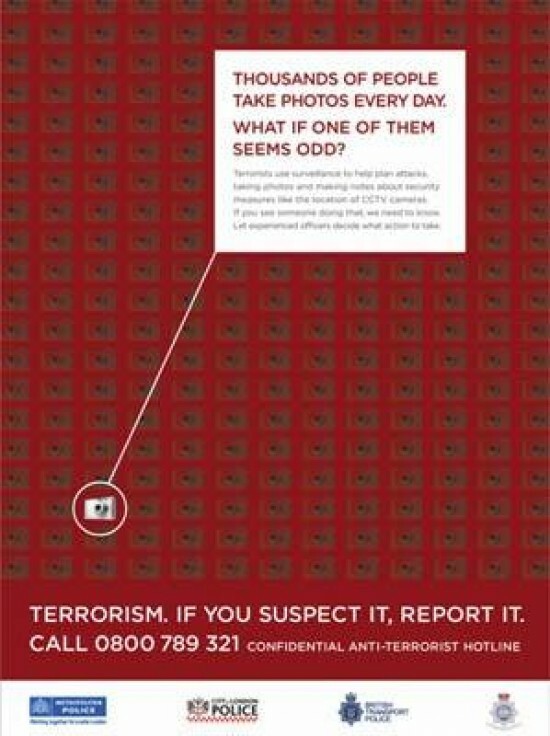 Last year London's Metroplitan Police force launched a "Counter-Terrorism" advertising campaign targeting photographers (see above photo). So what can you do in response? The Photographer’s Right by lawyer Bert P. Krages II is an essential download for US photographers. The UK Photographers Rights Guide by lecturer in law Linda Macpherson is the equivalent for UK photographers. There are other online guides to the legal position in Australia, New Zealand and Canada. "this House is concerned to encourage the spread and enjoyment of photography as the most genuine and accessible people's art; deplores the apparent increase in the number of reported incidents in which the police, police community support officers (PCSOs) or wardens attempt to stop street photography"
Have you been caught up in an unwanted confrontation? How did you handle it? Got any great advice or online resources? Share your story in the Comments section below.